Three Good Rats: "When I think of Queen I can remember my whole life"
"When I think of Queen I can remember my whole life"
I think that Mike Dawson and I are kindred spirits. We both name Queen as our favorite band and have been listening to them since childhood. We both borrowed their tapes from our older brothers (His brother is named Andrew; mine is David, but his middle name is Andrew. Coincidence?) He sang Bohemian Rhapsody a cappella in a talent show; I sang it karaoke at a librarian cocktail party. Neither of us got to see Queen in concert while Freddie Mercury was alive, but we both remember what we were doing when we heard he died. 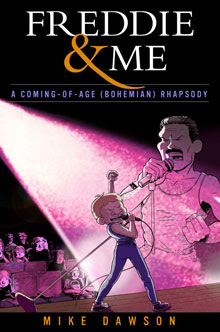 This graphic novel is not just about Queen, but about growing up and how linked our favorite music is to our personal lives and our memories. It reminded me of listening to Queen on 8-track in my brother's bedroom, and of buying their Greatest Hits album, the first cassette I ever bought. It reminded me of the moment I found out that Freddie Mercury died, when I was a freshman in college watching the news with my roommate who had no idea who he even was. He also reminded me of so many great songs I haven't listened to recently enough. Excuse me while I go update my ipod.